So, are you telling us that last week you personally conducted a heist of Gotham City’s largest bank and ripped off the most dangerous mob in the city for millions? AND now you’re planning an elaborate scheme to capture and unmask the Batman himself? You mean, you’re telling us that you have these lofty ambitions but you haven’t yet donned the likeness of the great Joker--the menace of Gotham and arch-rival to Batman? 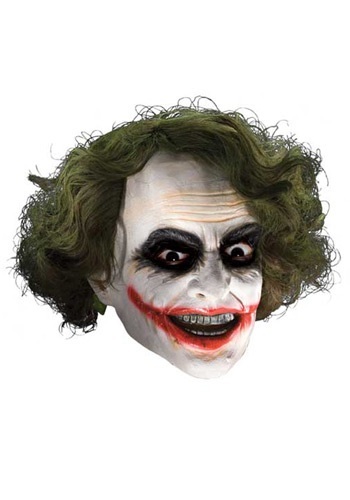 Well, you better get this Adult Deluxe Joker Mask with Hair to at least get you started in the right direction. You just can’t completely grip Gotham City in fear without the wide eyes and manic smile of the Joker. And how else will you show everyone that you mean business without this full head of chaotic green hair? When you put this life-like mask on, you’ll be ready to tell everyone how you got your scars and how you plan to cause chaos everywhere you go. Just make sure to first catch everyone’s attention with a really good magic trick--like making a pencil disappear.